How did you become involved in CELI? In 2015 I was looking for ways to become more involved in the clean energy space and found the Clean Energy Leadership Institute online. In one of those “fate moments,” an email landed in my work inbox a couple weeks later promoting CELI that was sent from the listserv of the company I was working for at the time. I took that as a sign and decided to go for it. I moved from Texas to DC shortly thereafter and found the CELI community to be super accepting and welcoming. I was a Fellow Fall of 2015 and had such a positive experience I applied to be a Fellowship Training Program (FTP) manager in the Spring. I’ve been involved in CELI ever since. You have also co-founded a company in that time. What has that been like? I’ve known since college that I wanted to do something on my own. I didn’t know what that would be or when but I’ve always been a risk taker. It was just a matter of finding the right opportunity. I met my co-founder Sam through CELI after asking him to speak at the retail electricity session. I realized we had a lot of similar thoughts on what the industry needed so I asked him to coffee. I walked away from that conversation knowing that we shared a lot of the same ideas about the need for more community solar projects and thought we could work well together. We founded District Solar in 2017. We don’t do community solar work today, but it was the catalyst for starting the conversation on how better solar offerings can be provided to DC residents. What inspired you to start District Solar? Established organizations aren’t structured to move as quickly as startups do, whether it’s testing markets, designing products, or changing business models. We wanted to to make change quickly so we knew we would need to start something on our own. 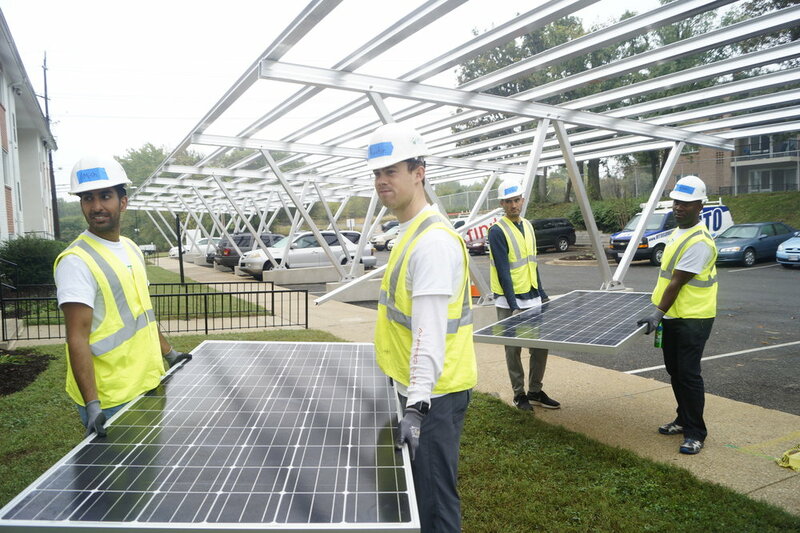 Both Sam and I saw that Washington D.C. had a need for more community solar projects and I was becoming increasingly frustrated in my job because of internal bureaucratic challenges in developing a community solar model despite Direct Energy’s clear competitive advantage in the market. The timing worked out because community solar was starting to gain steam industry wide and I had been investing a lot of time in exploring how to approach the products needed to make the projects successful. How did you know it was time to make it your full time job? I’d always been comfortable with risk so I don’t think I had the same amount of trepidation that others experience. On a more macro level, the policy around solar incentives had changed so it was also a really good time to enter the market. I was unhappy at my job and knew I had the experience and skillset to make it happen. Plus, I had already started testing some ideas with potential residential customers. All of that in addition to the privilege of having a family that could support me financially should I fail made the leap a lot less scary, and I acknowledge that it was a critical piece that I’m lucky to have. What advice do you have for others looking to start a business in clean energy? The burnout is real. Take advantage of the resources you have and don’t be afraid to lean on your community. The pressure makes striking a balance between your work and relationships with family, friends, and frankly, yourself, very challenging. Whether it’s in life or your business, plan for the long-term. When it comes to engaging with potential investors or customers, do not be afraid to engage in courageous conversations. Build meaningful relationships and ask the hard questions that will show you how to make positive, lasting change for everyone in the community. What do you think makes starting a business in clean energy different from other industries? The policy aspect. Things can change overnight that compromise your entire business model. The solar tariffs and changing renewable portfolio standards are a great examples of this happening. The rapid advances in technology are forcing jurisdictions to adapt in kind. Given the District’s appetite for lofty clean energy goals, we serve a small, dynamic market where it’s essential to pay attention to keep one ear in the DC Council and Public Services Commission. It’s very important to understand the policy landscape and design your business to withstand its uncertainty. What opportunities has CELI provided that helped grow your business? Obviously meeting Sam was a big one but the CELI network has been invaluable. And by network I don’t just mean the Fellows and Alumni, but all the people who support us as well. What really helped me grow the business personally was the continued learning offered by the program. As an FTP manager, I have technically taken the program 3 times.This gave me the opportunity to really become an expert in wholesale and retail electricity markets and taught me how to derive value out of a business model that I then applied to my business. How are you involved in CELI today? Today, I am primarily focused on recruitment and, in the short term, planning the emPower conference. Mish having a smashing time with DC CELIons. What do you look for when choosing the next cohort of Fellows? My top priority is diversity and inclusion: background, ethnicity, gender, all of it. I am also looking for a diverse range of professional backgrounds. Nuclear, carbon sequestration… it’s all a part of the solution and each perspective is important. Then, of course, I’m looking for passion and energy. For example, if you were going to evaluate the same two jobs in clean energy and oil and gas, you’re going to earn a higher salary in oil and gas. You have to have a lot of passion for the clean energy industry, otherwise you’re not cut out for being a leader in the space. I’m looking for people who share that passion and want to support all of us in being successful by giving back to the community. What are you most looking forward to this fall program? I’m always excited to see what new, unique ideas come from the cohort and the methods they find to bond, whether through book clubs, retreats etc. Naturally, this fall, I’m also looking forward to broadening the CELI community through the emPOWER conference. What is the emPOWER conference and why did you call it emPOWER? EmPOWER will be a non-traditional conference bringing together clean energy professionals and organizations across the public, private, and non-profit sectors.We want people to feel inspired or “empowered” if you will, to take the action needed to change the hearts and minds of policy makers, corporate leaders. I want to provide resources to empower groups that have historically been marginalized, or haven’t had a chance to collaborate, to start being a part of the clean energy transition. Simultaneously, I want to challenge the people and organizations already in power to engage in conversation and build relationships with these groups. I see CELI as the bridge between the incumbent energy organizations and the more nimble ones that can move fast enough to make that change in the time we need to really begin curbing climate change and mitigating the impact of the old energy paradigm. EmPOWER uniquely provides a chance to bring normally-disparate clean energy stakeholders together. The emPOWER conference is described as “non-traditional.” Define that for us. It’s not going to be as dry as typical conferences in clean energy. We want it to be engaging, action oriented, and interactive. It’s also going to bring together groups that I see as on the same side but have traditionally been at battle with each other. It’s time to have some courageous conversations. For example, it’s understandable why nuclear and renewables have disagreed in the past, but we must to work past that to address our mutual goals of zero-emission generation. I hope that having representatives from those groups working side by side to take action on some of these solutions will begin to build a community in ways that haven’t existed previously. What are some of the challenges you plan to workshop? 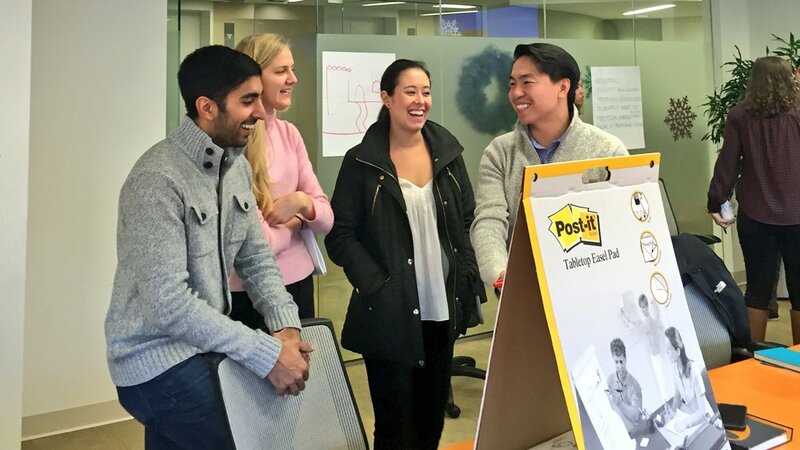 We definitely have ideas about what we want to focus on, from diversity and inclusion to policy trends, but also want to leave space for attendees to create their own path and have conversations for the topics on their minds. That’s my challenge! Come prepared with your own ideas or ready to support others who have them ready. Mish brainstorming how to revolutionize the clean energy space with colleagues. Who do you want to see at the conference? My hope is that young professionals who are looking for mentorship will make connections with seasoned experts looking to provide mentorship. I know that people looking for diverse perspectives on clean energy won’t be disappointed and am most excited for folks who are looking to join clean energy but aren’t quite sure where to start. I hope that everyone joining us will adapt their preconceived notions about different groups in clean energy, and connect with enthusiasts and leaders across the country so we can build a better future together. They can email my directly. I intentionally set up the email to go straight to my inbox because I want provide that mentorship as much as I can but mostly to continue connecting people with the right mentors. Reach out at empower@cleanenergyleaders.org. Thanks!